A credit card machine is a device used to process in-person payments with a credit or debit card. It can be handheld and corded, portable, or attached to a point-of-sale terminal with a countertop cash register. Depending on the type of credit card terminal you choose, the cost ranges from $0 to $1,200. Choosing the right credit card machine for your business’ needs can be as simple as choosing the right payment processor. Chase Merchant Services offers a variety of credit card terminals, from an easy-to-use mobile card reader to a full terminal, and pricing for the equipment is inexpensive. You can get a free customized quote from Chase. Get in touch today. A credit card terminal uses a phone line or an internet connection to complete the process of authenticating and submitting payments when a customer uses a credit or debit card. The newest credit card machines can take debit cards, major credit cards, contactless credit cards, and mobile payments. Regardless of which card payment method is chosen, the process is similar and the whole event happens in a matter of seconds. The request from the merchant to the bank for authorization to charge a card is the first step, with the final step down to whether it’s approved or denied. Request for authorization: As the cardholder swipes, dips, or taps their card to the credit card machine, a request from the merchant bank is sent to the card-issuing bank for authorization (i.e., “Is this a valid card?”). Approved or declined: If there are sufficient funds or credit available, and there’s nothing to indicate someone is using a stolen card, the transaction is approved and the sale completes. Otherwise, a card could be declined and another payment method will need to be used. From debit cards to Apple Pay, there are multiple ways customers pay for goods in stores, at events, over the phone, and online. There are multiple credit card machines that can handle every payment method, including virtual credit card terminals. Magstripe: A magnetic strip contains the important information, such as the card number, expiration date, credit limit, and more. A customer will “swipe” the card to make a payment. 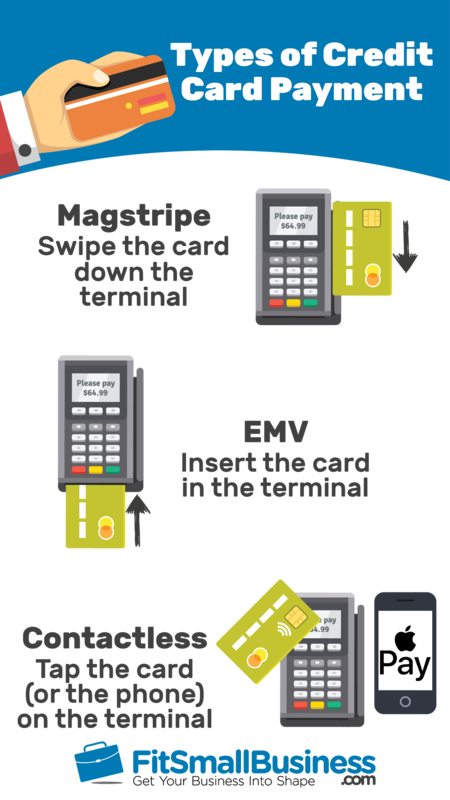 EMV: The Europay-Mastercard-Visa (EMV) card uses a computer chip in the card that is read by a credit card machine when a customer “dips” or inserts the card into a terminal slot. The same information that’s stored on a magstripe strip is in the card chip, but it’s sent through a unique code that’s created for each transaction. Contactless: A card or smartphone uses radio frequency identification (RFID) or near-field communication (NFC) to transmit a signal to a credit card machine that transfers the same information as a magstripe strip or card chip, but no signature or PIN are required if the payment goes through immediately. Debit: These are cards issued by a cardholder’s bank and they’re connected to a bank account. This is an alternative payment method to cash. Debit cards can be swiped or inserted into credit card machines, and a customer is expected to punch in their four-digit PIN on the keypad of the credit card machine. Keyed-in: Any credit card can be used manually, or virtually. A merchant keys in the credit card number to the credit card terminal, along with the expiration date and the security code, and the transaction is completed as normal without swiping, dipping, or tapping. There are three main types of credit card machines, and each one is meant for specific businesses, but they’re also mostly interchangeable. There are two other options that are considered modified versions of credit card terminals. A stationary credit card terminal includes a machine that lets a customer swipe, dip, or tap a credit or debit card to pay for a transaction. They typically include a keypad for keying in a credit card number or PIN, and a built-in receipt printer. Plus, they connect directly to a phone line or internet connection. The bare-bones type of countertop credit card machines only accept magstripe cards. The more secure credit card terminals also include a slot for chip cards. And the latest smart terminal can process any credit card payment, including contactless payments. A wireless credit card machine is usually smaller than a stationary one, but it includes all the same features. The only other exception is that a wireless credit card terminal connects to the internet wirelessly and through a cellular network, so you can use it anywhere that you can get a signal. A virtual credit card terminal can exist on a secure website, through an app for your smartphone, tablet, or on your desktop computer. Customers can key in their credit card information themselves on a website, or you can do it manually (such as when a customer places a phone order). A mobile credit card terminal is really just your smartphone or tablet with a Wi-Fi connection and a mobile card reader. 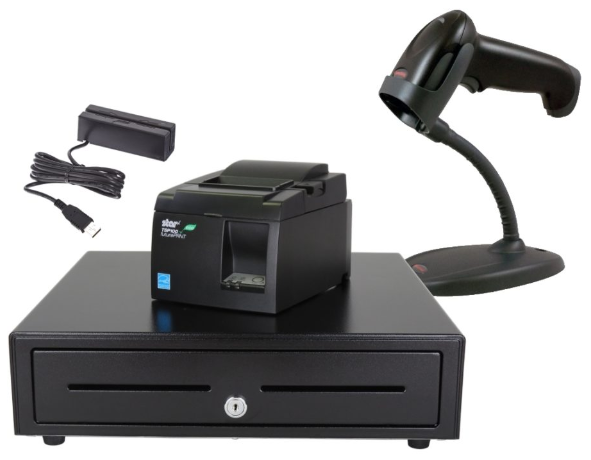 A full point-of-sale (POS) system includes a stationary credit card terminal, along with a receipt printer, cash drawer, monitor or tablet, and other hardware, such as a barcode scanner. Many credit card machines are nothing more than the hardware, but there are others that include POS software that let you manage inventory, customer profiles, transaction history, and data. Credit card machines will do you no good without a merchant account or payment processing provider. There are different types of merchant services providers (MSPs) and various payment processing fees and structures. Plus, other third-party entities are sometimes needed to ensure you can process credit cards online or virtually. These are considered traditional payment processors because you apply for your own merchant account, which typically comes with a merchant account representative. A business is approved based on various criteria, including credit, projected monthly credit card sales, low number of chargebacks, and usually low-risk status. Usually, MSPs provide a list of payment gateways they partner with, so you can accept credit cards through mail orders, phone orders, and online. A payment gateway provider is the company that makes it secure for you to process those credit card transactions, which helps you stay PCI compliant. High-risk merchants are usually those who sell products or services in industries where chargebacks are common. The list of high-risk industries is long, and often include vape shops, adult entertainment, weapons, and tech support. If a business’ application to an MSP is declined, they may need to seek a high-risk MSP. A payments processor is an all-in-one service that gives you access to a merchant account, a payment gateway, and the tools you need to process credit card transactions. These are usually considered aggregators because they lump a bunch of merchants into one merchant account. It translates to automatic or easy approval when you sign up, but it also means less specialized support. It can also lead to frozen assets or closed accounts if you have sudden, out-of-character (for your business) activity on your account. Depending on the MSP or payment processor, you can likely get free or low-cost credit card machines when you sign up for an account. Otherwise, you can purchase the hardware you need, including countertop credit card terminals, mobile, and other peripherals, from a reseller. The price range for a credit card machine is wide because of how many different types exist. 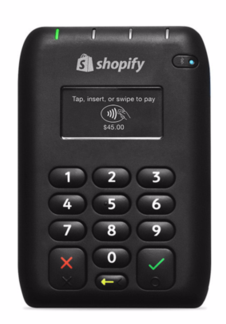 For a standalone credit card terminal, you can expect to pay about $150 to $700. A full POS system with periphery hardware can cost $300 to $2,500. Virtual credit card terminals are usually free downloads of apps, and you only pay for processing. 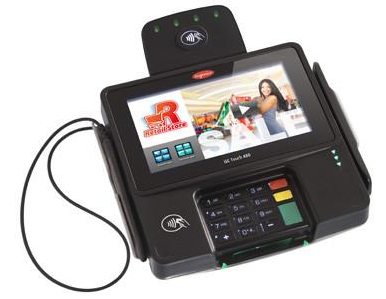 The typical credit card machine you see at many physical stores are standalone devices that connect to a bigger POS system. Some come with stands and swivel, while others can be passed from a cashier to a customer. Most credit card terminals will accept all forms of credit cards now. A mobile credit card reader isn’t quite the same as a terminal, but if you only process payments occasionally, it could be the best solution for you. These devices typically fit in the palm of your hand and connect to your smartphone or tablet through the headphone jack or via Bluetooth. 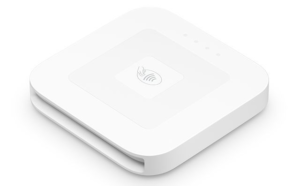 All work on Wi-Fi, so you can take payments anywhere, as long as you have a wireless internet connection. They also include free apps with POS features to help you manage your business. There are many options when it comes to finding a virtual credit card terminal, which requires you to have a payment gateway. In some cases, you’ll be able to create a free account and get started right away, like with Square. Others are an app or web login offered by a merchant services provider, and you may need to apply for a merchant account to use it. The payment processing fees and possibly a small monthly fee are what you’re likely going to pay (you’ll read more about associated costs later). 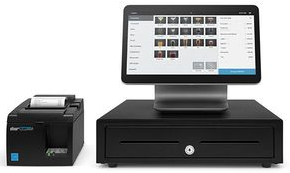 An all-in-one POS system includes all the hardware you need for a storefront, including a credit card terminal, monitor or stand, receipt printer, and cash drawer. Some kits may include a Bluetooth-enabled barcode scanner, a tablet, and POS software (though the software may come with a monthly fee). More specialized POS kits could include specific peripheral hardware for restaurants, such as a kitchen display system and kitchen printer. Many credit card machines are free with merchant accounts, but you can purchase your preferred credit card terminal online from a variety of resellers. Some merchant service providers and POS software providers offer leasing options, but you’ll likely save money in the long run if you buy your hardware upfront. Once you find the point-of-sale solution with the credit card machine that makes most sense for your store, you’ll be one step closer to being open for business. The cost of a credit card machine is one thing, but you’ll need a payment gateway, payment processor, and possibly a merchant account. Many services offer an all-in-one solution to allow you to accept payments with your credit card machines, virtual or actual, such as Square and PayPal Here. Typically, a merchant services provider or payments processor includes everything you need to accept payments with your credit card machine, so you won’t need to worry about payment gateways. However, for this convenience, and possibly included POS features or an online store, you may have to pay a monthly fee. 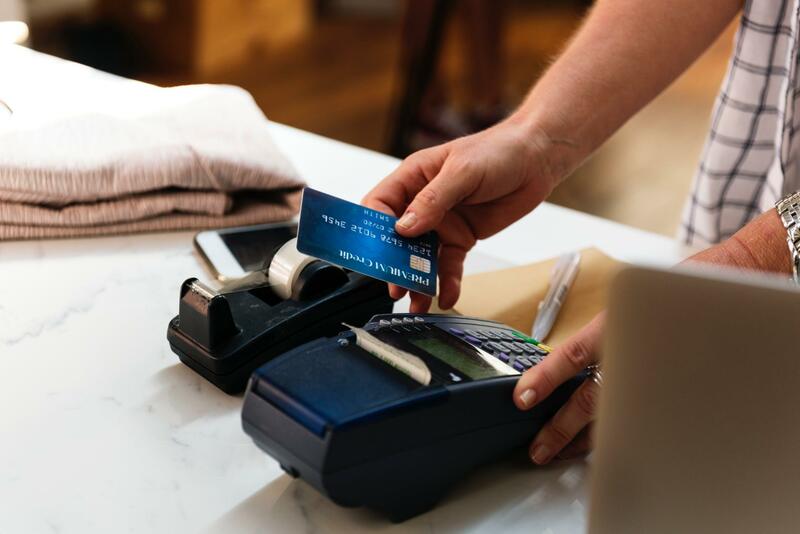 To use a credit card machine, you must ensure your business is PCI compliant, which is a security standard for accepting credit cards in-person or in card-not-present situations (online or by phone). The Payment Card Industry Data Security Standard (PCI DSS) helps ensure you’re doing all you can to protect your business and your customers from data breaches. In most cases, a merchant services provider or payments processor will include PCI compliance at no added cost to you, or it’s factored into your monthly fee. Others may charge you additional monthly or annual fees. It’s important to remember that PCI compliance isn’t just about your payment processor. Typically, if you aren’t paying a monthly fee to use your credit card machine with a payment processor, then you’ll pay for it through the transaction fees. Credit card processing fees are either fixed, interchange-plus, subscription, or tiered rates. Some MSPs, like Chase Merchant Services, offer different types of pricing for different businesses. You’ll find some merchant services providers that require you to meet a monthly minimum in transactions with your credit card machines or on a virtual credit card terminal. For example, Payline charges $25 if you don’t meet the $25 monthly minimum. For Fattmerchant, you’re paying $99 per month for its subscription model approach to fees. If you’re a seasonal merchant, such as a part-time caterer, or you only work summer events, you can contact your merchant services provider to work out a different plan. In the case of Fattmerchant, you can pause your account and only pay $25 per month to keep your account open. As you can see, there are many more credit card machine fees to consider when you set up your store, whether online, from a booth, or at a storefront. A mobile credit card machine and account with a fixed rate may work best for small businesses that process smaller payments, while a brick-and-mortar shop may want to choose a merchant services provider that charges interchange-plus rates. As you’ve seen, many credit card machines can be purchased (or given for free) to you when you sign up for an account with a payment processor. Often these payment processors offer mobile apps that you can use on your iOS or Android device to mimic an actual credit card machine. Also included are point-of-sale features that are invaluable to merchants. 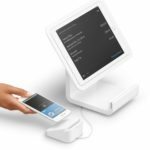 If you sign up for a free account with Square, you can expect to see all the basics of POS software. Even the more traditional Fattmerchant includes MX Merchant, an app that includes many POS features to help you manage your business. Even if the payment processor you choose to work with your credit card machine doesn’t include basic POS software, it’s likely you can integrate both your processor and credit card terminal with whichever POS software you choose to use. Whether you have a brick-and-mortar shop, an ecommerce business, a food truck, or a booth at a farmers market, a credit card machine is necessary so you can accept more than just cash payments. Depending on how often you expect to process credit card payments, you may need a merchant account, POS software, and you’ll have to consider the fees you’ll pay for each time a customer uses your credit card terminal. A credit card machine, especially an all-in-one type with a cash drawer, receipt printer, POS system, and barcode scanner, is essential for any business that sells products in a physical store. The countertop setup helps to streamline sales, from scanning barcodes on products to processing payments with the card reader and keypad. Whether you provide a service from a physical location or you are a mobile business, it’s helpful to have a credit card machine. If you take payments on location, such as at someone’s home, then you’ll want to look into a mobile credit card reader or a virtual credit card terminal using your smartphone or tablet. Any type of food business will want to have at least one countertop credit card machine, and possibly handheld credit card terminals with a POS system. Having an all-in-one system specifically made for restaurants can streamline the close of every ticket. Although food trucks are always on the move and aren’t tied to a physical location, you can’t expect customers to always have cash on hand. A mobile credit card machine is made for businesses that are in a different location day to day. You might also want to consider a food truck POS system. Most online businesses won’t require a traditional credit card machine unless there are plans to create a brick-and-mortar shop, too. Selling online only requires you have an account with a payment processor and an app for you to use on your smartphone, tablet, or computer to process credit cards manually. Even if you only sell products occasionally at various locations, a portable credit card machine can facilitate faster and more secure sales. As long as you have a wireless connection, a merchant account or a payment processor, and a credit card terminal, you can process credit cards wherever you sell products. Whatever you sell, a credit card machine is an essential tool for you to make those sales. As technology changes, so do credit card machines, so if you’re still using an old credit card terminal, you might be missing sales if your equipment can’t read the latest credit cards. Every credit card terminal has its pros and cons, depending on what your needs are. As long as you choose the right credit card machine for your needs, along with a payment processor that makes sense for your volume of sales, you should see more pros than cons. Affordable: They’re often free, or are offered at a low cost. Easy to use: They’re typically intuitive, as are the included mobile apps. Use anywhere: As long as you have Wi-Fi and an app, you can accept credit card payments. Limited card acceptance: If you stick to the free option only, you may only be able to accept magstripe or EMV chip cards. No printed receipts: You can typically email or text receipts to customers, but there’s no built-in receipt printer. Security concerns: Consumers may worry about vulnerabilities in the app, or being forced to use magstripe, rather than the more secure and encrypted EMV chip reader. Wireless: There’s no need to hook up the credit card machine directly to a router or phone line because it works on a cellular network. Line busting: Take your wireless credit card terminal out on the floor to accept credit card payments in your store to cut down on long line wait times. Cellular outage: If cell service goes down, so does your wireless credit card terminal. Extra costs: Just like a cell phone, you’re going to have costs associated with connecting a wireless credit card machine. Direct connection: A direct connection to the internet is typically faster and more stable than Wi-Fi. Built-in receipt printer: You can print a receipt for a customer right from the credit card machine. Built-in keypad: Customers can opt to use a debit card with their PIN and you don’t have to pass over your smartphone. Fewer features: You might miss out on an opportunity to collect valuable customer information, which is more likely when you email receipts to customers through a mobile solution. No extra equipment: All you need is a computer or an online store with a payment gateway integrated to accept credit card payments. More expensive: Keyed-in credit card payments are always more expensive in transaction fees than card-present transactions. Less secure: There’s a greater chance of fraud with credit card payments made online or over the phone, which is what contributes to the higher transaction fees. Whichever credit card machine you choose for your small business, you’ll have advantages and disadvantages. Pick the credit card terminal that makes most sense for you, or a combination of credit card terminal solutions, and you’ll be ready to accept credit card payments anywhere. As you shop around to find the best options for you in credit card terminals, payment processors, and more, you might find you have other questions. We answered a few of the most frequently asked questions regarding credit card machines. Do you still have questions? Ask it in our forum. Does a credit card machine need internet? The short answer is yes. The longer answer is you’ll need either a dedicated phone line for wired standard credit card machines; an Ethernet solution with high-speed internet; or a wireless credit card machine that uses cellular data. What’s the difference between a credit card machine & a POS system? A credit card machine or terminal simply processes credit card payments. 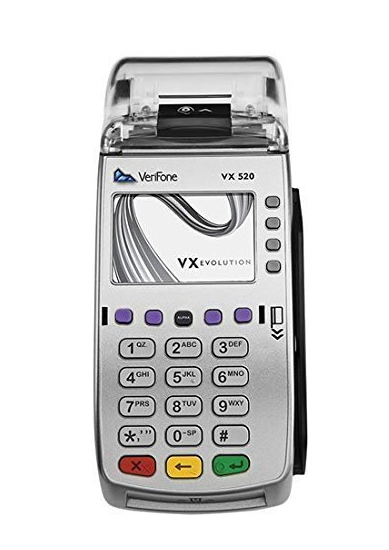 Its features are limited to, but do not always include, a touch screen, keypad, magstripe swiper, EMV chip card slot, and contactless technology. A POS system includes software and hardware to help complete a point-of-sale transaction, such as credit card processing, cash drawer, receipt printer, barcode scanner, inventory management, customer profiles, employee management, and data analytics. Which credit card machine is best for small business? There is no single answer for this question, as every small business has different needs. To find out which credit card machine and payment processor would be best for your type of business, check out some of our guides. From payment gateways to PCI compliance, there are plenty of terms and definitions that relate to credit card machines that you should know. Credit card processing is going to be a big part of your small business management, and it’s important to arm yourself with this knowledge. Assessment fees: These are fees charged by major credit cards, including Visa, MasterCard, and Discover, and the fees change periodically. Authorization: A stage in the credit card process in which the issuing bank approves or denies a request for funds or credit. Batch: Typically, a day of transactions, which are settled (paid) to the merchant at the end of the day. Card not present: A credit card payment made online, by phone, or through mail order in which the card is not physically present during the transaction. Chip card: A credit or debit card with a microchip (see EMV) that encrypts credit card data when a consumer inserts their card into a chip-enabled credit card machine to make a transaction. Chargeback: A consumer disputes a charge to their account to their issuing bank, which results in request for the funds to be returned from the merchant. Contactless: A credit card that uses radio-frequency identification (see RFID) or near-field communications (see NFC) to make a payment when a consumer taps the card or mobile device to a credit card machine that’s equipped with the technology to receive such payments. 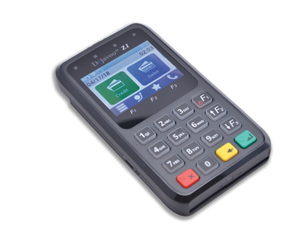 EMV: Stands for Europay, MasterCard, and Visa (see chip card). Encryption: A security measure that encodes credit card data before being sent over an internet connection to complete each transaction process. Interchange fees: Transaction fees set by credit card-issuing banks. Issuing bank: A financial institution that grants customers credit. Merchant account: A bank account that grants a merchant the ability to accept credit card payments. Merchant services provider: A business that provides a variety of services to store owners, such as payment processing and payment gateways. Mobile payments: A contactless form of payment using a smartphone, such as Apple Pay, Google Wallet, and so on. MOTO: The abbreviation used in payment processing for mail order or phone order. 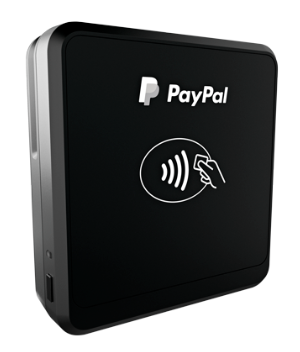 NFC: A method of short-range communication between devices, such as a smartphone used for payment (see contactless); stands for near-field communication. Payment gateway: The security technology needed for a merchant to safely accept credit card payments online or using a mobile phone. Payment processor: An entity that enables the process of accepting, authorizing, and settling credit card payments. These can be third-party aggregators, like Square or PayPal, or they’re part of a merchant services provider’s offerings. PIN: This stands for Personal Identification Number, and it’s typically used by a debit card holder to validate the use of the card. Point of sale: Where a payment or transaction for goods or services takes place. It is also used to describe the software and hardware needed to help complete a financial transaction. PCI compliance: Stands for Payment Card Industry, and it’s the data security standard that all merchants must meet to protect their own business and customers from data breaches. While third-party payment processors must be PCI compliant, merchants have steps they must take to also be PCI compliant. The steps to compliance can be found here. RFID: This stands for radio-frequency identification, and it is used on some credit cards (see contactless) to make payments on credit card machines that are RFID- and NFC-enabled. Settlement: The final process of a credit card transaction in which the payment requested by a merchant is paid from the issuing bank to the merchant account. Every small business needs credit card machines to process credit card payments, and there are plenty of options from which to choose. Many merchant services providers can pair you with the right credit card terminal for your business, or you can go with a third-party payment processor and take all the guesswork out of choosing the right credit card machine for you. Chase Merchant Services offers a variety of credit card machines for all types of businesses, and it can fit a payment processing solution to your needs—fixed or interchange-plus pricing. You can find a solution for your online business, food truck, restaurant, or retail shop with Chase Merchant Services. To get started, you only need to answer a few question on its website. Apply today for your account.